Knowledge about Wind Power Can SAVE Your Money! Like any other natural power source, people in earlier days were quite aware of wind power too. This awareness or knowledge, whatever you may call it was more so with sailors who used a good wind to sail their ships. They knew which wind was helpful and those that brought misfortune and shipwrecks. Incidentally, the famous Leonardo da Vinci was considered to be an authority on wind. Even in those days (1452) he knew how a Wind Machine (aircraft) could lift, taking advantage of wind power forcing the machine to go up. Another person who was considered a wizard in wind was none else than Christopher Columbus, the great explorer. He was so convinced about wind and its unfailing power that he sailed over the uncharted Atlantic for more than a month before his men sighted land (the <?xml:namespace prefix = st1 ns = "urn:schemas-microsoft-com:office:smarttags" />Bahamas). However, none of them knew that wind power can be harnessed for generating electricity. Nevertheless, wind power was utilized for gaining mechanical power as well by our ancestors. Instances of wind power machines were abundant in Persia during 200 BC and Romans too utilized them in 250 AD. Early vertical-axle windmills were built in Afghanistan in the 7th century. With long vertical driveshaft and rectangular blades covered in reed, these Afghan windmills could draw water for agricultural purposes. While horizontal-axle windmills came into existence in Europe in 1137 at Leister, Dutch windmills were mostly used in draining the Rhine River delta regions for a long time during the 14th century. By the year 1900 there were more than 2,500 windmills in Denmark that worked as pumps for drawing water or mills for crushing corn. Americans visiting Europe soon learnt the trick of harnessing wind power and during 1890 to 1900, Midwest America was flooded with windmills pumping water in ranches or doing corn crushing jobs in large agricultural farms. With the turn of the century, a dynamic change of outlook swept over the world when people desperately looked for alternative source of energy, especially renewable energy to replace fossil fuel generated electricity that had ruined the earth’s atmosphere. And anyways, the fossil fuel reserves were going down fast and soon an alternative would be required. The dangers associated with global warming and excessive air pollution made governments and public authorities declare incentives for using renewable energies. And so, the use of solar and wind power was promoted in homes as well as in commercial establishments. In the USA it was conceived that by 2020, at least 20% of the fossil fuel generated electricity would be replaced by wind power or through photovoltaic panels. Even the new US President Barack Hussain Obama before he entering the White House declared, “When I am the President, any governor who’s willing to promote clean energy will have a partner in the White House. Any company that’s willing to invest in clean energy will have an ally in Washington. And any nation that’s willing to join the cause of combating climate change will have an ally in the United States.” Wind power, naturally has come to stay as the most convenient eco-friendly cost effective power generator. Being a safe and clean energy, wind power can change the world. Just imagine a future where there are no thermal or nuclear power plants and they have all been replaced by wind power that leverages the natural wind to make electricity. And not only are the authorities in the US, but governments in many European and Asian countries are also actively pushing wind power. Your own personal wind power is now possible. It is a great idea because while on the one hand you can promote clean air, on the other you can save on your power bills. 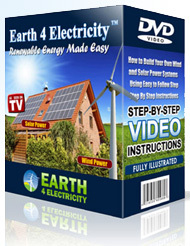 So go ahead and build your own wind power system – but you will need information about where to set it up in your home, how to do it and wire the system, where to get the parts from and also the safety precautions. Here is a manual that will show you all this step-by-step.